Expensify offers SSO through Google Apps. In order to set this up for users, you must be an admin for a group policy using a Collect or Control plan. We’ve launched in the Google Apps Marketplace to help businesses who have embraced the cloud. This puts us a click away from IT managers and department heads at hundreds of thousands of small-to-medium sized businesses worldwide. And that’s not a metaphor: we’re one click away (ok, two if you’re being picky) when Expensify is installed in your universal navigation bar. Please note: Google SSO is not yet supported on Expensify's mobile application. Before you install the Expensify App, you'll need to make sure you have API access enabled. In the Google Admin Dashboard, click Security, then API reference, then make sure 'Enable API access' is checked. To enable Expensify for your Google Apps domain, follow the steps below to add an “expenses” link to your universal navigation bar. 1. Sign in to your Google Apps Admin console as an administrator. 2. Click 'Apps' to show your Google Apps. 3. Click 'Marketplace apps' to open the marketplace. 4. Search the Marketplace for 'Expensify', then click 'Install App' next to Expensify's page listing. 5. Click 'Continue' to start installing the app. 6. Make sure the correct domain is selected, then click 'Accept'. 8. Your entire domain can now access Expensify through the apps icon, then click 'More' and click 'Expensify'. If you are a Google Apps domain administrator and an Expensify policy administrator, you can easily sync your Google Apps users to your Expensify policy. 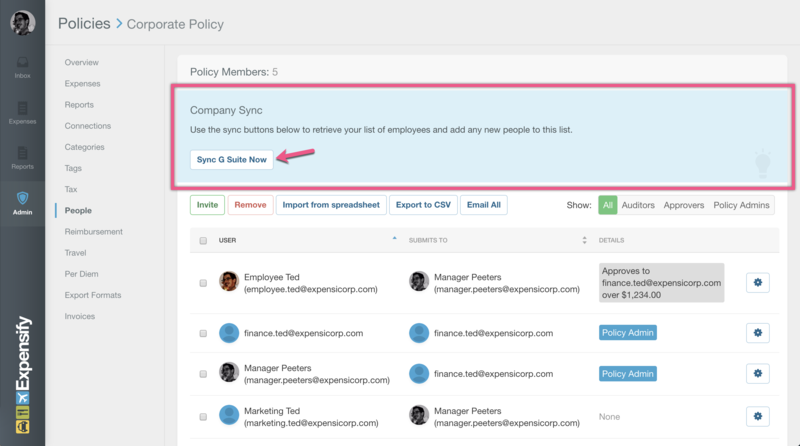 Once you've installed the Google Apps Marketplace Expensify app, just log in to Expensify, go to Settings > Policies > Group > [Policy Name] > People, then click 'Sync G Suite Now'. This will identify any people who are not already on the policy and invite them to the policy.